The hero of this interview, a musician from Finland Ferus Melek, unlike many of his colleagues cannot boast of a huge fan base and great fame in the retrowave scene. 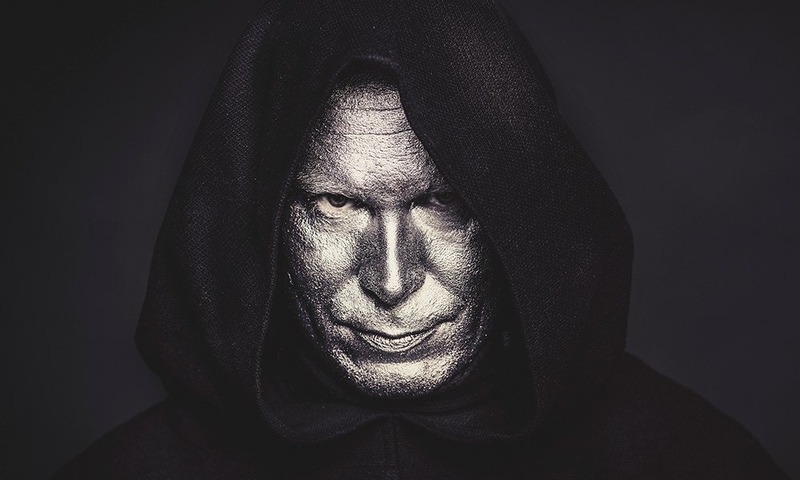 But this does not prevent him from creating his gloomy darksynth-symphony, full of skepticism about the end of all things and the arrival of universal darkness. However, this gloom is immediately diluted with a drop of something bright, which giving the hope. This element is strikingly distinguishes the work of the artist from his colleagues on the dark side of synthwave. In this interview, Ferus chose to answer briefly and to the point, keeping his halo of mystery and not going into personal stories. Remembering the wisdom of “Brevity is the soul of wit”, we talked about his image, musical career and much more. Hello, Ferus! Thank you for agreeing to talk to RETROWAVER about yourself, your music, and more. To start the talking, introduce yourself to our readers, please! Hey there reader! I am a composer/producer from Finland. I’ve been doing music for a few decades and for 1,5 years with the name Ferus Melek. Great! You said it’s your first interview in career. What do you expect from it? I have zero expectations, so let’s do this! Okay! I think the first thing we can talk about is your person. Please tell us how long you have been doing music? Who instilled an interest to music to you? My first touch in making electronic music was probably around ’86, when I got my hands on Commodore 64. It had a simple sound editor and I started hitting notes in. Obviously it sounded like crap but I truly adored the sound of the SID-engine and the music of the game composers at that time. And I still do actually! And there´s your answer, for my musical career we can blame guys like Martin Galway, Rob Hubbard and Ben Daglish, just to name a few. After that I had my years playing in heavy metal bands (bass/drums) and doing industrial music as a solo project. Years 2002-2015 I did absolutely no music at all and I felt sick everyday [laughing]. In which music genre have you had the chance to try your masterpiece? What influenced on your choice to work in the genre of synthwave? As I told earlier, my roots are in SID-sounds, heavy metal and industrial. When I got active again in the late 2016, it was not that conscious decision that I want to do synthwave and it still isn’t. I like the fact that synthwave as a genre is kind of a broad label nowadays, so it allows a disturbance like me to infiltrate into it [laughing]. Which of the artists is your idol, and whose influence do you feel during writing tracks? Who would you like to perform on the same stage? I’m not sure if I have any idols, but all the best known game composers of the ’80s and of course: Nik Kershaw. If I could someday write a song like “The Riddle” I would retire immediately. At this point I cannot even visualize myself on the stage, so it´s hard to answer the second question. Maybe someone who is more talented live player than I am! Do you use someone’s advice or your music style is purely original and created independently? I do think originality a lot; I don’t want to be a copycat or a one trick pony, which does the same song over and over again. I want to challenge myself and all my three listeners (mom, dad and the neighbor’s dog) by doing something different compared to what I used to do earlier. It could be hard for some listeners to take it if I first release a song like “Recall District” and after that “The Dream Master”. There’s a big gap between those songs, but I hope that there’s continuity, although not that obvious all the times. Okay, it’s time to talk about your art. To begin, please reveal the secret of your image. Who is Ferus Melek and why is it so gloomy? I guess that’s why the concept of your work I would define as “thinking of demon about this world before its end.” And how would you describe your music work? I think my music is rather dark, but not in the typical darksynth way which is more towards distortion and aggression. I like to use a broader palette of emotions. And to be honest, it’s not even always that dark! New EP will bring a lot of new elements on board. 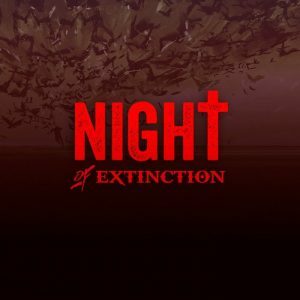 Let’s talk about your first album “Night of Extinction”. What was the trigger to create this dark EP? How long have you been creating it? Which motives did you use to create it? All my three EPs have been created with a story first approach. I create some kind of universe in my head before composing period and when the days go by, it somehow starts to translate into music. That way “Night of Extinction” got started, I just lived through the end of the world [laughs]. It took about 3 months to put the music together and I had zero pressure to do it, because I honestly didn’t know much about how use my digital audio workstation or how to mix properly etc. It was a nice time, it’s always easy when you don’t even know all the rules that can be broken. You continued the theme of “the end of all things” in your second release “Dawn of the Dead”. Is it related to the zombie theme somehow? Was this EP a little easier than the debut with the presence of experience in the genre? Yes, it’s very much about zombies but not only zombies. There’s also this character called “Son of Dark Light” who was a mysterious zombie killer. Composing process was actually harder than with the first EP, because I wanted to do everything so much better. I wanted to manage the dramaturgic tension better and the production had to be better all the way. I also challenged myself more with the vocals, which was and still is pretty stressful for me. What equipment and instruments do you use to create your tracks? My setup is very simple: Macbook pro, Reason 10, two midi keyboards, one mic, and software synths only. I am very much “in-the-box” producer, although occasionally I borrow my friend’s bass and guitar for a certain songs. Suomi land gave many outstanding representatives of the retrowave genre. It’s a freaky Megahammer, forever left in the 80’s; Ace Buchannon, “dreaming ” about sands of Miami beach; Flash Arnold, under the tracks of whom you can easily become a jock like Iron Arnie. Who from finnish retrowave-community is your friend? Is it possible, in your opinion, to assert about the unity of Finnish retrowave movement like Swedish or French? I don’t think Finland has a movement yet, but synthwave is doing allright here and frequent parties and gigs are here to stay. There are some bigger and more established names like Megahammer and Nightstop, and then there are some rising stars like Turbo Knight who has made a hell of an impact to the scene just in a year. I count myself to the “bubbling under” underground and its doing well too, many talented guys are doing their stuff and we will hear about them for sure. My closest friends in the scene are Turbo Knight, Levinsky and Streetgazer. Do you feel that you’re late “joined” into the genre of synthwave, when many of the ideas of creation and motives are outdated and not interesting? Is there, in your opinion, the crisis of ideas in retrowave? I “joined” the scene 1,5 years ago, so you could really call me a rookie. My blessing is that I really don’t know the history of synthwave that well and when it comes to my music, the driving force of it is something else than nostalgy. So this is something I don’t think too much. There are only handful of producers of whom I follow actively, so I can’t really say how the scene is doing in general. But in all genres, there are always these generic copycats recycling old ideas, so I wouldn’t say that synthwave is lacking more ideas than any other genre. What place does music take in your life? How much time do you spend on writing singles a day? I would like to write music every day, but I really can’t. I have a regular job and a little daughter, so I can’t contribute the extinction every day [laughing]. I do music mostly on weekends. Have you ever been to Russia? Do you familiar with Russian musicians creativity? Who made the most impression on you? Unfortunately not and that bothers me, because we are neighbors and I have seen some great videos of your synthwave parties! I also know that you have many artists there, but again I haven’t done my homework very well: I only know Moskva-Kassiopeya and Turboslash. But they are great! Your next album “Decay of the Mainframe” will be released on May 26th. Judging by the cover, you’ve moved away from the theme of the Apocalypse to the sci-fi theme. Tell us briefly, what is this release about? Thank you again for your participation and detailed answers. Further success in creativity! Thanks, this was all my pleasure. Retrowaver, live long and prosper!